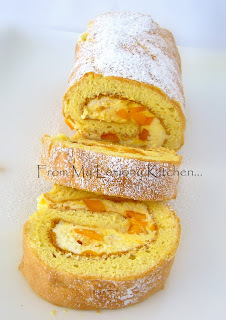 A friend and my blog reader, Mrs Red Hat... asked, in one of my 'Post comments'... whether I have Mango Swissroll recipe?? 2 Mangoes~ 1 for puree and another dice. Preheat the oven to 220C. Line a swissroll pan or baking tray with greaseproof paper. Brush the greaseproof paper with melted butter. In a mixing bowl, whisk egg yolks with half the sugar until creamy. In another mixing bowl, whisk the egg whites until frothy. Sprinkle the rest of the sugar (2 tablespoon at a time)... whisk until very stiff (like making a meringue). Pour egg whites mixture onto the egg yolks. Sift both flours onto the egg mixture. Gently fold with a metal or plastic spatula until thoroughly mix. Place the mix in the prepared baking tray, smooth over. Bake for 10-12 minutes. Turn the cake over onto a greaseproof paper (sprinkle with icing sugar) and placed a slightly damp cloth on the swissroll ~ to avoid drying up. Leave it to cool. 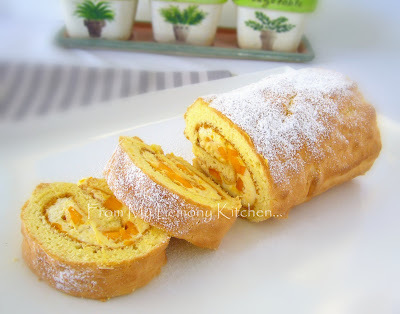 Spread the mango puree over the swiss roll. Then spread the fresh cream and placed the diced mango on top of the fresh cream. Note: if the puree is a little bit on the watery side ~ then cook over low fire until slightly thickened. A drop of mango essence into the cake batter if available. Your mango swiss roll looks more mangolicious than the one sold at NORTHBRIDGE. Bravo!